I've recently done some testing with my Nomad, and did a reset button mod by connecting cartridge slot connector point B2 to ground. It has the intended effect of resetting the game, but when the Everdrive is in use, I notice it always goes to the menu, even if the menu option "Reset to Game" is set to "ON". 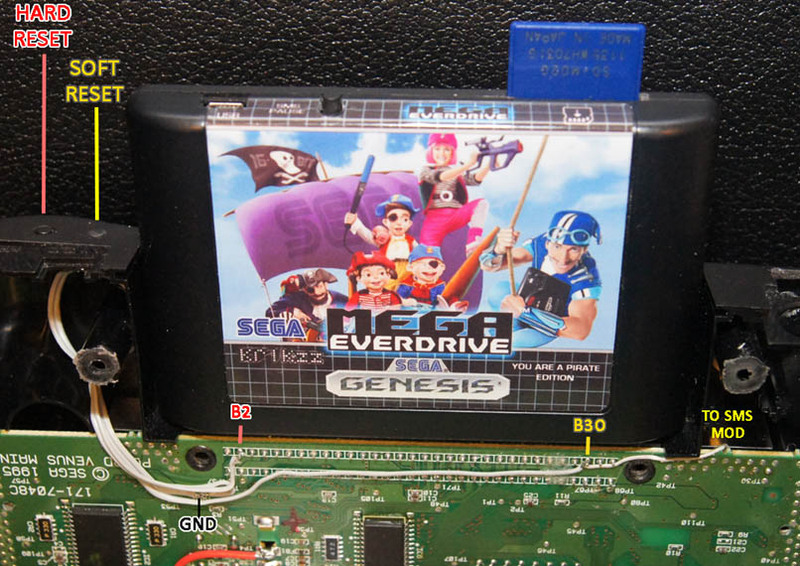 The Everdrive still saves states and save RAM to the SD correctly, so at least my reset button can be used for that. Then, it occurred to me, that perhaps the Mega Everdrive is doing this exact same thing (B2 to Ground) on its own reset button switch, since I've seen the Nomad Reset Button Mod described as being similar to the "SMS Pause" mod; and we know that's also what the Mega Everdrive does in SMS mode. So, on my Nomad it seems that I can only reset to the menu. I would like to be able to reset back to the game, as well as to the menu when needed. I was wondering if there is any way to get a "normal" reset to game on a Nomad when using the Mega Everdrive? Would there be a way to add an option to the firmware that adds another option that allows the everdrive's reset button to do a normal reset unless it is held for 3 seconds, at which point it goes to the menu? Or is there a different kind of mod that can be done to the Nomad to get the same kind of reset that a normal Genesis has? Any insight would be appreciated. Thanks! Thank you for the reply. It gave me a hint and it seems the cartridge pinout has 3 reset points: B2 "!H_RESET", B27 "!RESET" and B30 "!S_RESET". I'm guessing I can try B30 and see if I can get a non-menu reset to work. Is this the pin you were talking about? Anyway I will let you know the result. Update: GND+B30 works for soft resets as expected, but as I had mentioned before, the hard reset is still necessary in order to properly save the backup ram to SD for Master System games (since the Mega Everdrive reset becomes a pause button in SMS mode). So on my Nomad I have implemented 2 reset buttons: one to B2 for Hard Reset / saving to SD in SMS mode, and the other to B30 for soft resets. This works very well. If someone wants to play SMS games on the Nomad with proper saving to the Mega Everdrive SD card, the hard reset button is the higher priority, but it is more convenient to have both.